As we mentioned previously, Sinan worked as the head architect for a long time - half of a century..
During this period Sinan was both a full architect (design + supervision) and the designer of 477 structures.. Around 300 of them were in Istanbul. 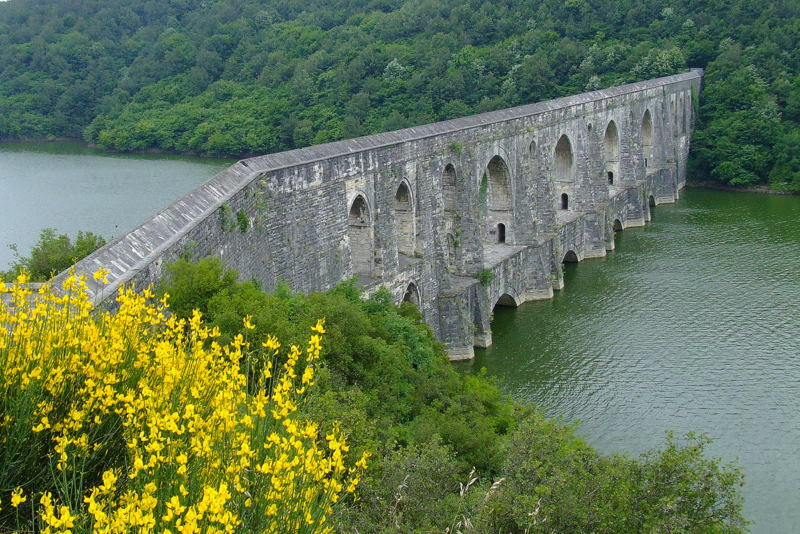 There was an architectural formation which is called Hassa mimarlar ocagi, in Ottoman state system. Sinan was the head of this formation. Hassa mimarlar ocagi was a kind of school where he educated many architects and during his period of active duty, his apprentices were sent all over the empire to apply his designs.. It is quite important that some of the buildings attributed to him were built by his students. While the construction of Suleymaniye was in full scale, there was another kulliye for the name of Suleyman in Damascus for example.. He was working in such a way that while he was applying and supervising his designs in Istanbul, he was designing a castle at the border with Austria and appointing an architect for it for example..
During his period, it should also be noted that the number of Muslim architects was not great in Hassa architects. They were mainly devshirmes, Christians, and Greeks.. This is quite important because, in the end, each mosque from that era should be considered a part of Kulliye as opposed to a single structure..
Sinan calls it as ´the building from his apprenticeship´ period. This is quite important because Sehzade kulliye is the first kulliye Sinan built for the sultan. It was called as sehzade mosque (sehzade means prince..) because it was dedicated to Prince/sehzade Mehmed, who was the favourite son of Suleyman. It took 4 or 5 years to built. It was opened in 1548. This mosque is a square mosque.. 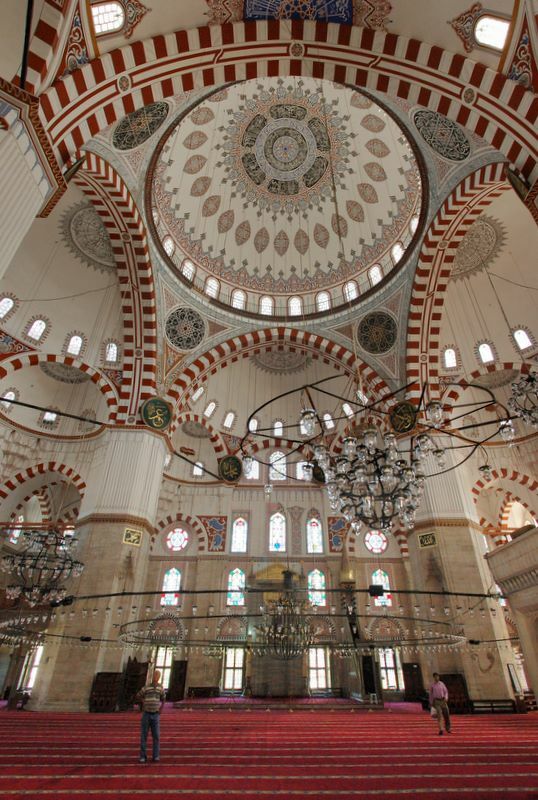 Diameter of its dome is 19 and the height of it is 37 meters.. 4 half domes support the central dome. 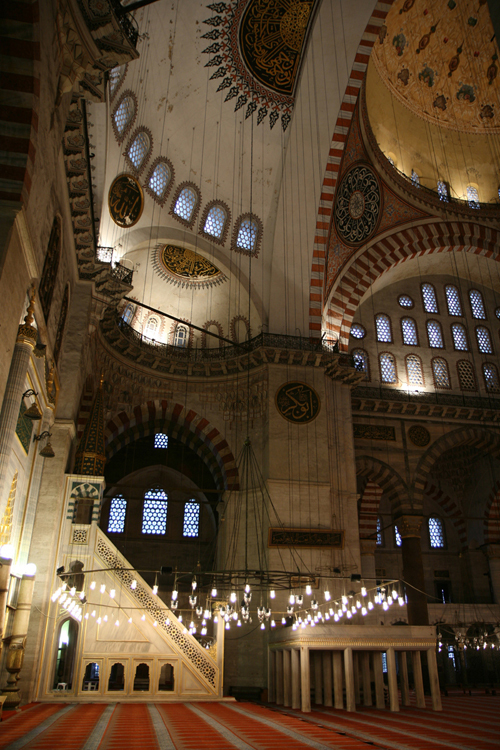 It is the mosque where Sinan used almost all known classical Turkish construction traditions..Its minarets are especially elaborate and Sinan did not built that type of eye catching minarets after this mosque. Both its courtyard and the mosque were built on a 5 X 5 grid and symmetrically on both axis!! This mosque had a quite important place in Sinan´s life since it was the first complex he built as the head of architects for the name of the Sultan´s son.. The importance was coming from the fact that he had to build something for the sultan Suleyman himself as well - something even grander, bigger, more majestic.. 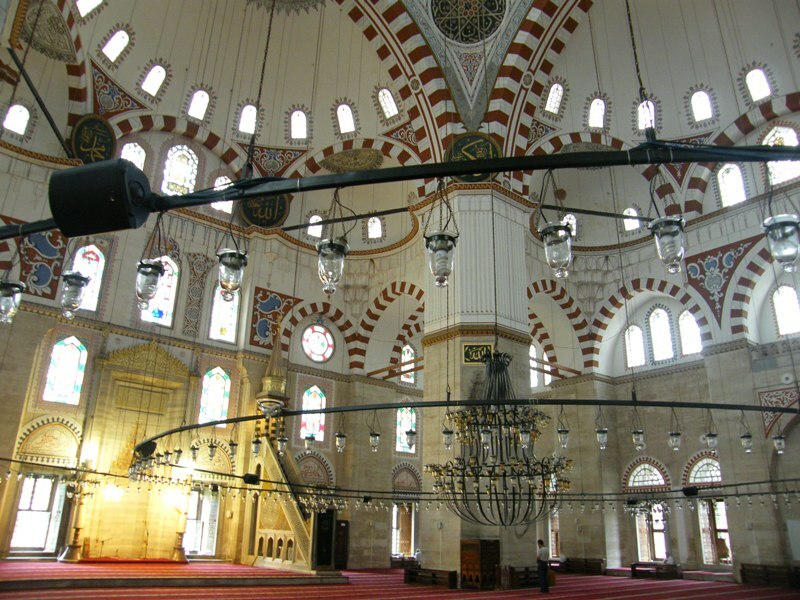 He had to built Suleymaniye Mosque!!.. -It is the symbol of Ottoman institutionalised social life. -It was the biggest kulliye in Ottoman history. -It was one of the centres of Istanbul´s life with its hospital, education center,public kitchen. -It was one of the biggest construction organization in Ottoman history. Its construction started some time between 7-17 June in 1550 -some say 13 June 1550 Thursday- and it was opened in October 1557. During its period of construction, there would be 2.000 people working during summer days (and some days over 3.000 people). Some years, they took a winter break between mid November to mid march.. They brought the material for construction from almost from every corner of the Empire. Marble pillar were collected from all over place and they built special ships to carry them. Its hospital was the biggest hospital and the centre of medical education of the empire. Vakif can be translated as charity I guess..It is a very important word for the ottomans because almost all social services were given to people by vakifs/charities in cities.. In Ottomans, everybody and everything belonged to the Sultan..There was not a classical feudality. They did not have aristocracy. They did not have very powerful families. There were people given some limited rights by the sultan. The sultan was the ruler and him and his representatives were trying to keep their subjects (people) happy as they were the owners!! Charitable actions were kind of compulsory for the sultans and the people, who acquired power and wealth, by using vakifs..
Three pillars of the empire were status of empire, the army and vakifs.. Even before Sultan Suleyman, around 30.000 people of Istanbul were eating in those public kitchens.. People would not pay a single penny for those services in kulliyes such as medication, food, education, water etc. Because they were all done as good deeds for God.. "No cities in the world could reach the level of social help in Istanbul between 16 and 18 century"!! Some wiki info: The main dome is 53 meters high and has a diameter of 26.5 meters. At the time it was built, the dome was the highest in the Ottoman Empire, when measured from sea level, but still lower from its base and smaller in diameter than that of Hagia Sophia. 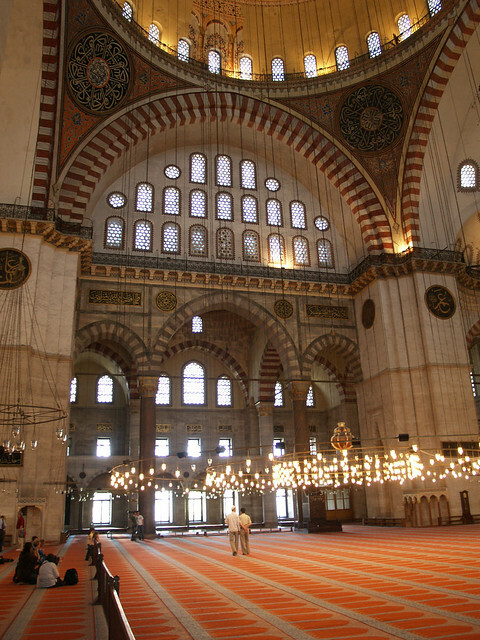 The interior of the mosque is almost a square, 59 meters in length and 58 meters in width, forming a single vast space. 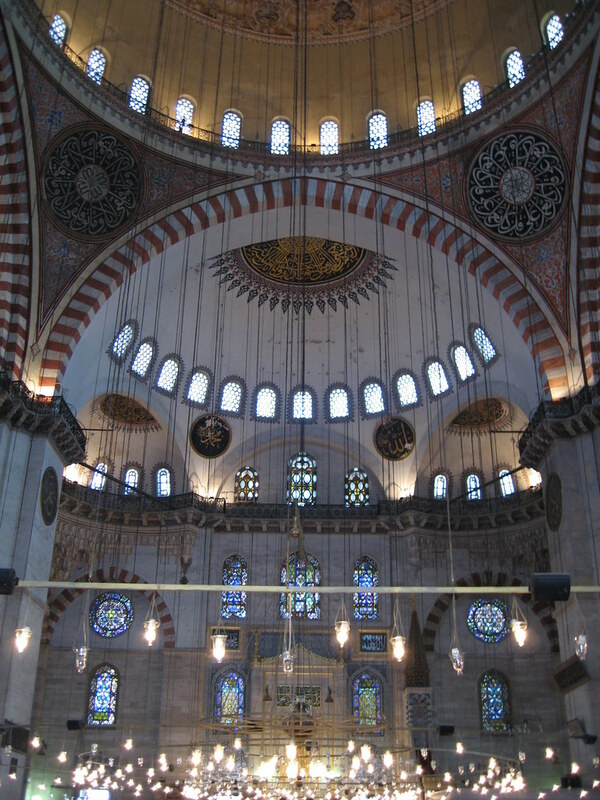 The dome is flanked by semi-domes..The interior decoration is subtle, with very restrained use of Iznik tiles. Just one more mosque I would like to mention is Semsi Pasa aka Kuskonmaz Camii. (Kuskonmaz= kus/bird, konmaz/does not land. Kuskonmaz means a place birds dont land). The story is, one of the viziers of the sultan,Semsi Pasa, was in competition with another one, the gand vizier Sokullu Mehmet Pasa. They would banter semi jokingly when they saw eachother.. One day Semsi Pasa says to Sokullu ´Sokullu, birds are shitting on your mosque´ and Sokullu replies as ´ anything open to the sky bound to be made dirty by the birds´. When Semsi Pasa decided to build a mosque, he went to Sinan and asked him to build a mosque into a place where no birds could make the mosque dirty. Sinan, after a long and hard investigation, finds the spot where northern and southern winds intersect. Apperantly no birds land over that mosque.. It is the smallest kulliye complex Sinan ever built in his entire life. It is one of the sweetest mosques I have ever seen..